OK. So it’s not Neil Armstrong’s “giant leap for mankind. But 10 seconds later, in a substation at the bottom of the stadium, Ehman threw a switch — and a colleague threw a switch — and the lights came on at Michigan Stadium for the first ever night game in 132 years of Wolverines football. They may never turn them off. Because with 8 seconds left in the latest and perhaps most thrilling, twisting, maddeningly illogical and breathtaking chapter of the Michigan-Notre Dame rivalry, Denard Robinson threw the ball as if playing pop-up catch in his backyard, and it came down in the hands of a leaping Roy Roundtree for a touchdown and an ending they’ll be talking about a decade from now, let alone today. “Coach always says, ‘The game is not over until there is 0:00 on the clock,’ ” Roundtree said afterward. Better check it one more time. For all we know they’re still playing. Really? Michigan won this one? Eighty yards in three plays? touchdowns in the final 72 seconds? Four touchdowns in the fourth quarter? Yep. And it’s even harder to believe because, let’s be honest, for most of the game, the reality of inheriting one of the worst-ranked defenses in the nation was being harshly (excuse the word) “illuminated” for Brady Hoke and a ready-for-prime-time sellout crowd, as Notre Dame ran through Michigan, passed through Michigan, and racked up enough yards (513) to have twice as many points as it ultimately scored. Not that the Irish needed them. For most of the game, the Wolverines couldn’t rack up many of their own. Going into the last minute of the third quarter, they had seven points and not a single offensive series longer than four plays. And then, everything went nuts. Something strange cascaded down from those new beams atop the rim of Michigan Stadium. You’d need a Russian novel to contain all that followed. Suffice it to say the Fighting Irish had chances to win, and gave them away, the Wolverines had chances to win, and gave THEM away. Robinson picked up a fumble by the goal line and ran it in. He threw a toss-up pass and saw Jeremy Gallon turn pogo stick for six points. He dumped a screen pass underneath and saw Vincent Smith scamper in for another touchdown. And, finally, he lofted that 16-yard moon ball to Roundtree, who pulled it in, and by a score of 35-31, the team that should not have won did — unless if you believe in home fate and lighting. But you can’t blame him for wanting to get out the tool box. Robinson’s late heroics turned “Bright Lights, Big Pity” into a 2-0 record and a midnight dance party. It’s a huge victory for the new coach. It could be a momentum builder for the season. And it’s a priceless memory for those who were lucky enough or rich enough to get a ticket. But it easily could have gone the other way. Be honest. You expected it would. Robinson’s star power overshadowed a lot of other stories. There was frequent lack of pressure by the still-learning Michigan defense. There was the inability of the Michigan offense to get any run game going besides its quarterback. There was the stellar play of Notre Dame’s No. 3, Michael Floyd, who started the season on probation for a DUI but played Saturday more like an MVP. Floyd was one of the best receivers in the nation coming in, and Saturday night he had the numbers to prove it: 13 catches for 159 yards. But by the end Floyd was just another chorus member to the ingénue Robinson, who had 446 yards of total offense against the Irish after having more than 500 against them last year. What is absolutely crazy is that this turned out to be the best passing game, yardage-wise, of his career. And for much of the night, I thought he was playing an awful game — three bad interceptions, some poor decisions, and up-and-down run results. But midnight erases many sins, and when the game ended, it was nothing but love for No. 16, who immersed himself in the yellow pompommed students’ section. They may never give him back. That the Wolverines did. And he did, too. You have to admit, no matter how many early mistakes he made, Robinson played the fourth quarter as if he’d just gotten there. No residual depression for this kid. He defies logic. His three interceptions were fundamentally unsound —both mechanically and decision-wise — and most of the game you kept asking yourself: Who are the Wolverines kidding? Why isn’t he running more and throwing less? Robinson is fast and Robinson is strong but Robinson is not accurate, not yet, not enough to win in the Big Ten, right? And yet, when he needed miracles, he created them. And that’s kind of who he is. True, he needs to give big props to his receivers, particular the leaping Roundtree and Gallon, and the indefatigable Junior Hemmingway (three catches, 165 yards), who came back for an underthrown ball and took it past a defender for the Wolverines’ first touchdown. But Robinson is the straw in the drink. And the 114,804 serenaded him with cheers when he emerged after the game was over. “We’ve got to play a lot better,” Hoke said. And most certainly they do. 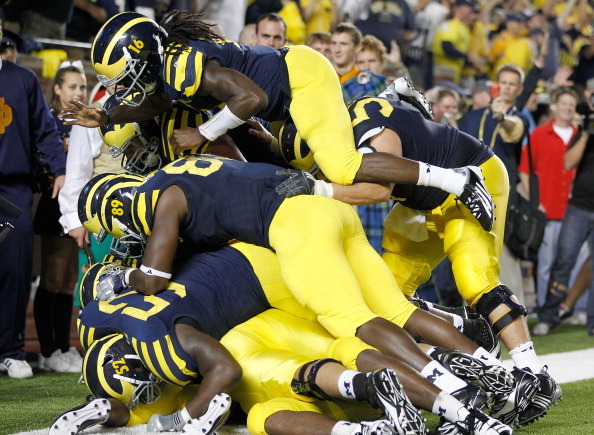 But, hey, this is Michigan, where pomp is as big as circumstance, and Saturday night was full of both. It had Notre Dame, Desmond Howard, the 1971 team, parachutists from the 101st Airborne, one indescribable quarterback, several leaping receivers, a defense that broke then broke back, and an ending for the ages. After this, you wonder if they’ll ever play in the daytime again. Contact MITCH ALBOM: 313-223-4581 or malbom@freepress.com. Catch “The Mitch Albom Show” 5-7 p.m. weekdays on WJR-AM (760). Also catch “Monday Sports Albom” 7-8 p.m. Mondays on WJR. To read his recent columns, go to www.freep.com/mitch. This entry was posted on Sunday, September 11th, 2011 at 6:32 pm and is filed under College Sports. You can follow any responses to this entry through the RSS 2.0 feed. Responses are currently closed, but you can trackback from your own site.